Starting yesterday, I noticed that Postal is giving me the "stranger danger" (confirmation, 3-second count down, etc.) warning for my own characters (even though they are on the same server). If I turn off Postal, the problem goes away. So, I am reasonably sure it is Postal doing it. umm that don't seem right how is the r403-alpha for game version 7.0.3 and put out about an hour ago when where in 7.2 patch/game version? I may be crazy, but I believe at one point in the past, simply opening the mailbox would trigger an OpenAll. I can't seem to find this functionality anymore after returning to the game from a year ago. Was this removed or am I thinking of another AddOn? Will there be an update in the near future? The last time Postal was update was back in August. MoP is out and I miss using Postal to mail my alts and guild members. 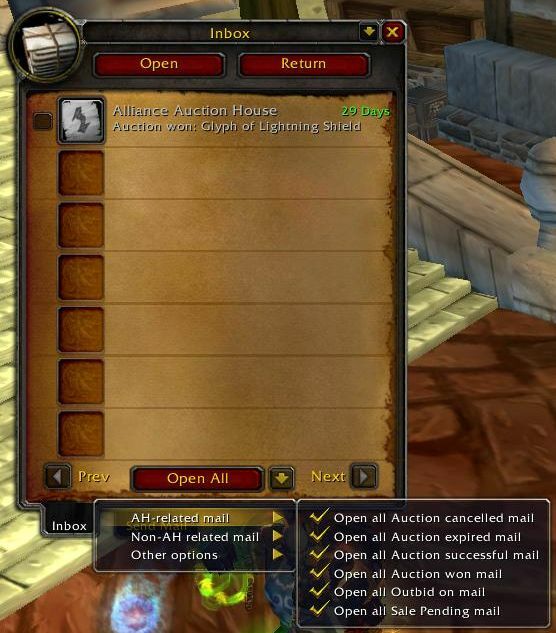 re: "Author Notice: BeanCounter from the Auctioneer suite of addons is known to cause issues with Postal (primarily with the Open All functionality). Auctioneer has not been updated for Mists of Pandaria yet (as of 31 August 2012)." I haven't done extensive testing, but Postal and Auctioneer appear to co-exist just fine for me (I use both), including the Open All functionality. Thanks! With regards to openall not refreshing mailbox beyond first 50, I figured it was server throttling the request? Maybe only affects high pop realms, dunno. Whenever I open a lot of mails I usually have to wait 30-60 seconds between the refresh of another 50 mails. I get same error as Reeb. Got this error when i was just trying out r355. I know its not a release version so just ignore / delete this if you already know but thought id post it on the off-chance you didn't. A number of addons, and even the default UI closes the menu when certain things happen in game. Such as people joning/leaving the party. I have a tiny request; well you see I have recently installed "Postal" and I like it, its a great Addon but since I use BulkMail2Inbox too -I like the list of all mails he displays- there button would overlap each other (here I mean the [Open All]@ and [Take All] button), so can you fix it or maybe add new features to postal like a a list of all mail -like the one in BulkMail2Inbox-. Xinhuan you know what would be a hot feature. "ignore librams"
as a person working on the insane i'm frequently visiting AH and selling stuff from dire maul. i want to use openall but i want it to ignore books i purposely leave in mailbox. would this be at all possible? You have some addon marking mail as read. Could be Auctioneer or Altoholic or something like that. It's definitely not Postal. Any particular reason all my mail is getting marked as read as of recently (don't recall which update I started noticing it at)? Not just a graphical glitch either, the minimap unread mail icon is disappearing too. Not game breaking, nothing's missing or anything, just puzzling.